Mark Scheifele: Quality over Quantity - The Point Data-driven hockey storytelling that gets right to the point. The NHL’s shot quality king came up big for Winnipeg in overtime last night, burying a shot from the slot to give the Jets a 5-4 win over the Tampa Bay Lightning. Mark Scheifele’s 21st goal of the season, two shy of matching his total from last season, came on just his 89th shot. Do some quick math and that’s a shooting percentage of 23.6. There isn’t a player in the league with more goals on fewer shots, though Brayden Point has 21 goals on 89 shots, as well. You’ll see his name again in a minute. This is usually the part where you’ll see some people talk about an impending regression, as the league average shooting percentage for forwards this season is less than half of Scheifele’s at 11.4%. However, certain averages don’t apply to a player who is anything but average. Mark Scheifele doesn’t waste shots. He rarely shoots the puck if he doesn’t think he can score and like any smart hockey player, he knows where he’s most likely to score from. This season, over three quarters of Scheifele’s shot attempts have come from the slot, an area where three quarters of goals are scored from. 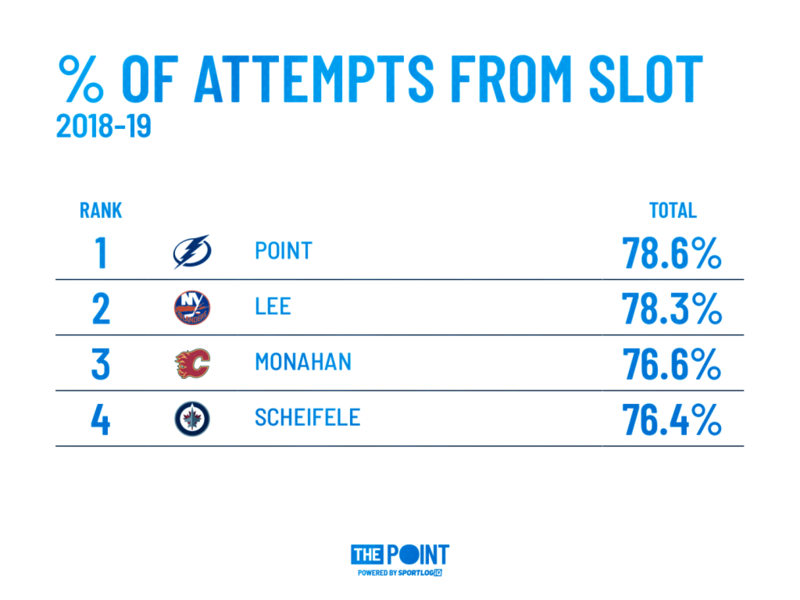 There’s Scheifele and there’s Point, who is leading the league in the percentage of his shot attempts that come from the slot. Being among the league leaders in this area is nothing new for Scheifele, who is defying shooting averages for the third straight season. Last year, Scheifele, limited to just 60 games, scored 23 goals on just 125 shots on net. Again, no player scored more goals on fewer shots. His shooting percentage hovered around 20 percent, 18 percent to be exact and once again, he was near the top of the league in the percentage of his attempts that came from the house. The year before that, 2016-17, Scheifele buried 32 goals on 160 shots, good for a shooting percentage of exactly 20%. Only T.J. Oshie, 33 goals on 143 shots, scored more goals on fewer shots. 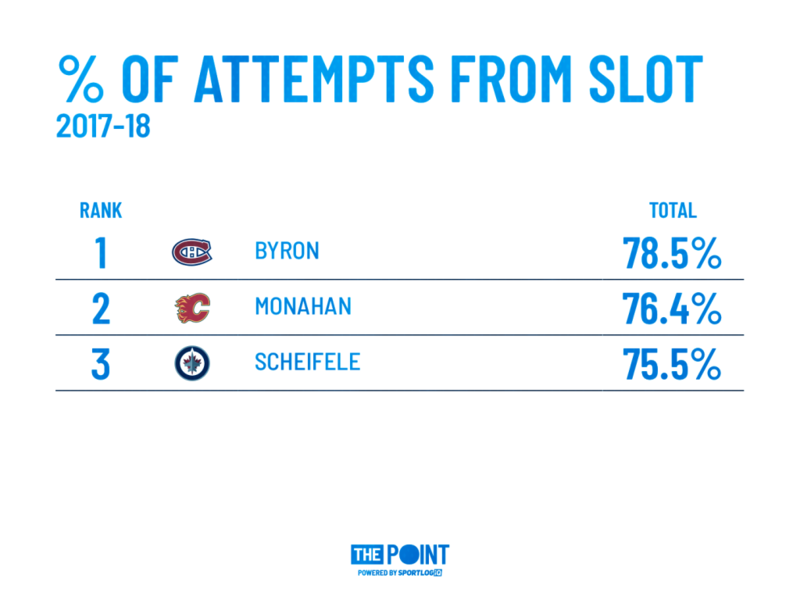 Scheifele led the NHL that season in the percentage of his attempts that came from the slot, 74.3%. Oshie ranked 5th at 69.4%. It was after that season that I suspected Scheifele would likely be a 20-ish percent shooter going forward for the reasons mentioned above. Thankfully, the production quality has improved a bit as The Point continues to grow:) PS – some exciting news to come in the new year on that front. Anyways, it’s a perfect storm for Mark Scheifele, who has a terrific shot, does a great job of getting open in contested areas and continues to benefit from playing with one of the best passers in the league in Blake Wheeler. 19 of Scheifele’s 21 goals have come from the slot and you can bet he’ll continue to score and shoot almost exclusively from that area going forward.